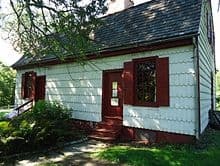 Fort Griswold is a former American military base in Groton, Connecticut. 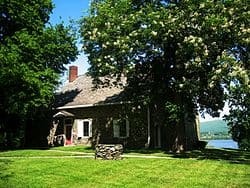 Named after then Deputy Governor Matthew Griswold, the fort played a key role in the early stages of the American Revolutionary War. In tandem with Fort Trumbull on the opposite side of the harbor, Griswold served to defend the port of New London, a supply center for the new Continental Army and a friendly port for Connecticut-sanctioned privateers who preyed on British ships. In September 1781, British troops under Benedict Arnold raided and burned New London in the Battle of Groton Heights with the objective of ending the harassment at sea. 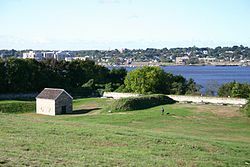 Fort Griswold had a key strategic position above the Thames River, but the British knew the fort’s inner workings thanks to the turncoat (Arnold) who gave numerous secrets of American defenses to the British forces he commanded. Arnold, knowing Griswold’s layout and precise position, approached the harbor from such an angle that Griswold’s gun positions could never draw an effective shot on the British fleet. Arnold’s troops eventually made landfall, and the fort’s garrison fought back. Artillery barrages and musket fire brought (relatively) heavy casualties to each side, the fighting continuing even past commands to stop. The British eventually captured the fort and tried to destroy it, though the plan was foiled as a patriot put out the British fire before it could reach Griswold’s gunpowder stores. When the British finally made it in, Colonel William Ledyard surrendered, gave the commanding officer his sword, and was killed with his own sword. Arnold only commanded a raiding party, not a conquering force, so the fort was abandoned as Arnold left New London in flames. 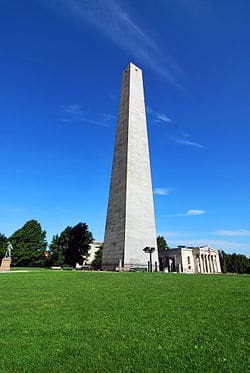 The base would be rebuilt and manned in several other conflicts, but the Battle of Groton Heights was its most prominent use. The State of Connecticut now owns and operates the site as Fort Griswold Battlefield State Park. The site includes the restored earthwork battery, cannons, and a later period shot furnace and powder magazine. The grounds include several monuments and memorials to state residents who fought in different wars.